Flowers are one of those gifts that will bring a smile to virtually anyone’s face. There’s just something so warm and welcoming about beautiful blossoms and their vibrant bursts of color. This Mother’s Day, consider sending a From You Flowers Mother’s Day Flower Bouquet to the moms in your life. From You Flowers’ offer a beautiful variety of Mother’s Day flowers and gifts. You will be receiving one of our most popular flower arrangements, Floral Celebration for Mom. 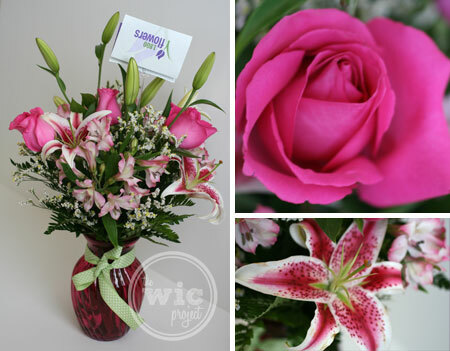 Arranged by a local florist with fresh lilies and roses, this is a perfect gift to send to your mom this year. My Mother’s Day Flower Bouquet from From You Flowers arrived in a lovely pink vase, wrapped with a polka dot white and green ribbon. As soon as the flowers arrived at the house, I couldn’t help but admire their elegant beauty. Each blossom was fresh without any wilting and the colors of the roses were a deep pink color. These flowers were definitely freshly cut since they lasted just over a week, quite a few days longer than other flower bouquets I’ve had in the past.